Seniors Tevis Bartlett and Ben Burr-Kirven started their freshman seasons as roommates in 2015. Now they'll close their college careers as Washington's starting inside linebackers. Tevis Bartlett and Ben Burr-Kirven couldn’t always communicate. Washington’s starting linebackers came in together as freshmen in 2015 — Bartlett from Cheyenne, Wyo., and Burr-Kirven from Atherton, Calif. They were essentially strangers turned teammates. “Ben was very introverted to start,” Bartlett said last week. “He’s a big film guy. He loves watching indie films. He’s a film major. When we were in the (dorm) room he would just put his Beats (headphones) on and watch movies all the time. I was, like, trying to say what’s up (and get to know him). Three years later, Bartlett and Burr-Kirven’s communication has improved — and for good reason. On Saturday, the seniors will serve as two of the Huskies’ starting linebackers for No. 6 Washington’s season opener against No. 9 Auburn in Atlanta. Of course, Burr-Kirven — a 6-foot, 221-pound middle linebacker — is a constant in the middle of the Husky defense, a sideline-to-sideline player who led the team with 84 tackles and added four tackles for loss, two forced fumbles, an interception and a sack last fall. When Bartlett — who finished with 48 tackles, 12 tackles for loss, four sacks, two interceptions and a fumble recovery as a SAM linebacker in 2017 — shifted inside to the WILL spot this spring, he consulted with his former roommate (as well as just about everybody else in the linebackers room). There was a lot to learn. “It’s still a lot of the same techniques. It’s just putting different techniques to different calls,” Bartlett said. “On one play where I’m setting the edge or rushing, now I’m doing a skinny-hook drop or whatever the case may be. It’s getting that down first, and then just reading run is a lot different on the inside, because you’ve got pullers and linemen and I can’t see the ball sometimes. Adding to the intrigue is the fact that, after practicing exclusively as the starting WILL (weakside inside) linebacker in fall camp, Bartlett was surprisingly listed back at the starting SAM (strongside outside) spot on Tuesday’s game-week depth chart. Regardless, Bartlett is no stranger to offseason position changes. The 6-foot-3, 233-pounder played quarterback and safety (and was a national-champion wrestler) at Cheyenne East High School from 2011 to 2014. Then, in 2015 he played all 13 games at Washington as a true-freshman linebacker. Suffice to say, a cramped dorm room and an introverted roommate were the least of his concerns. “It was a big transition for me. I was definitely very raw,” Bartlett said of his freshman season. “I went from playing quarterback and safety and then all of a sudden I was expected to set the edge and rush the passer, which I had never done at any point in my career. Whether at WILL or SAM, Bartlett (and the rest of the linebackers) will be tested Saturday. Instead of challenging one of the premier secondaries in college football, expect Auburn — which has produced a 1,000-yard rusher in nine consecutive seasons — to attempt to establish the run with backs Kam Martin and JaTarvious Whitlow. Washington’s front seven will be forced to answer the challenge. And its senior linebackers will have to take a more vocal role. “Ben and I are definitely more lead-by-example kind of guys,” Bartlett said. “Ben can be vocal. Especially when he gets going and makes a couple plays, he’s fun to be around. He gets after people. But that’s kind of who we are by nature. 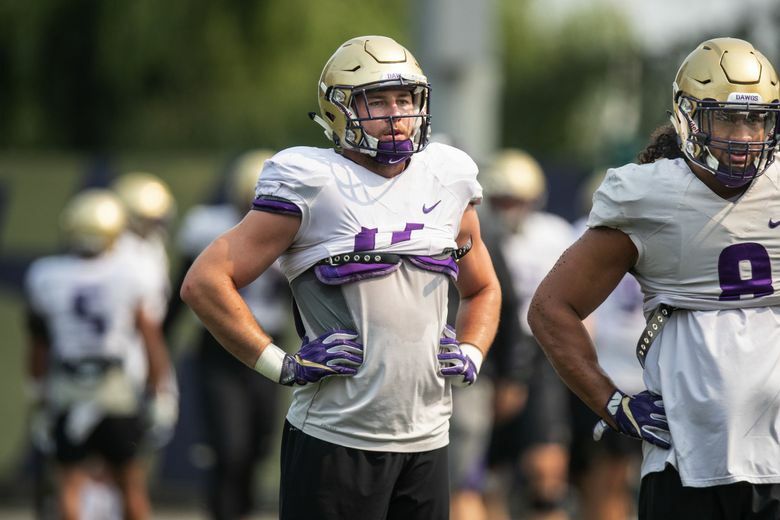 Bartlett and Burr-Kirven’s best will be required both Saturday and beyond, especially if the Huskies hope to fulfill lofty College Football Playoff expectations. On the field, like in the dorm room, they may be sharing tight quarters once again.